I have an 06 Z with the grand touring (or track model) rims, which recently got curbed. 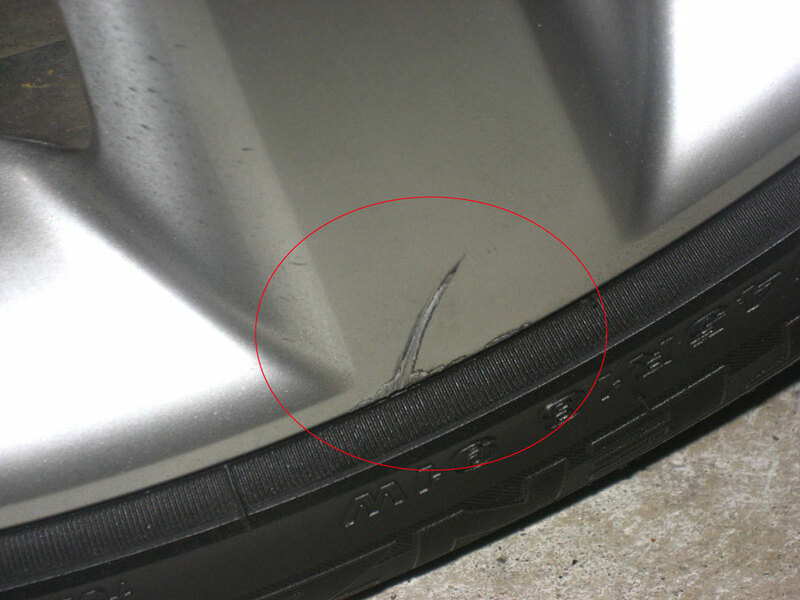 Anyways my dad was apparently the one who curbed them, so he agreed to get them fixed for me. However the rims had some spots on them that somehow got stained in the finish, so what is going to end up happening is I am just gonna get the rims current finish stripped and re-finished. However, I now have a choice between what kind of finish I want for them. 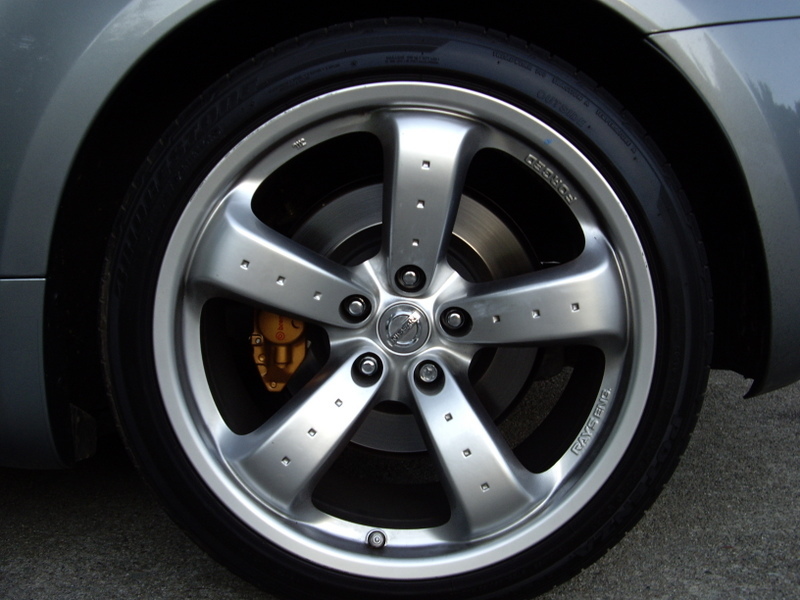 I was originally just thinking about getting them re-powdercoated, however I recently started thinking about getting a polished finish instead to give a more unique (and hopefully better looking) appearance to the wheels, and my Z. Anyways I am just wondering what some opinions are on Z's with polished rims, and if these wheels might look better with a polished finish, or if I am just better off keeping a powder finish. Any suggestions for any other finishes that might look good on these wheels with my Z are definitely welcome as well. Last edited by JJ350; 07-01-2007 at 06:50 PM. Stupid question, but how much does it cost? My 07 wheels got curbed and I like the way they look...might get after market eventually. Is there a point beyond repair? 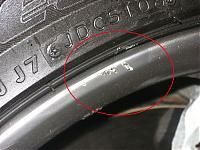 If it's just curb rash you got, than you may be looking around $90-$100 a wheel. However I am getting my whole finish redone due to stains in the stock finish, so I am at roughly around $200 a wheel. I just checked out some places to find where I wanted to get the work done at, so these aren't exact prices, just an estimate. Im not even planning on getting the work done for another week or two anyways, since the labor takes a few days and I just need my Z this week. 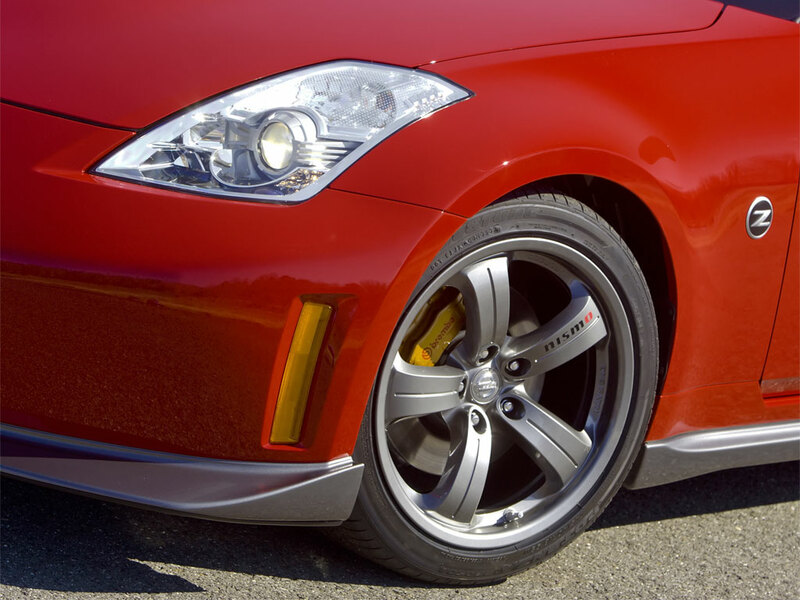 with a silverstone car i would try for color similar to ray's titanium gunmetal. that would look sick on your car. I was recently thinking about that as well. 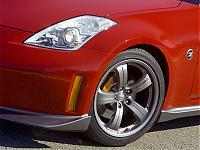 If I would go for that finish, than the wheels should look almost exactly like the ones on the new Nismo 350Z. Last edited by JJ350; 07-01-2007 at 07:09 PM. Don't mean to high jack the thread, but I don't want to start a new thread for something that is already be discussed. 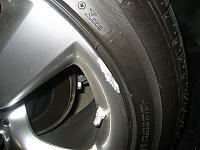 But I have pictures of my two curbed wheels and was wondering if people think it even worth trying to get fixed. The rear wheel is the biggest and happen while trying to avoid a trash trush on the wrong side of the road on a two way street, I avoided him but had the cut the wheel a little to much and kinda hoped the curb a little... I wanted to get the city to pay for it but I have 0 proof. Oddly enough you can't see it unless you look for it. 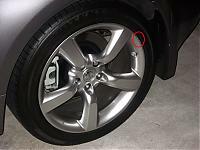 The front wheel has three small ones, but they are more noticeable. If you can get this color do it, it looks awesome! 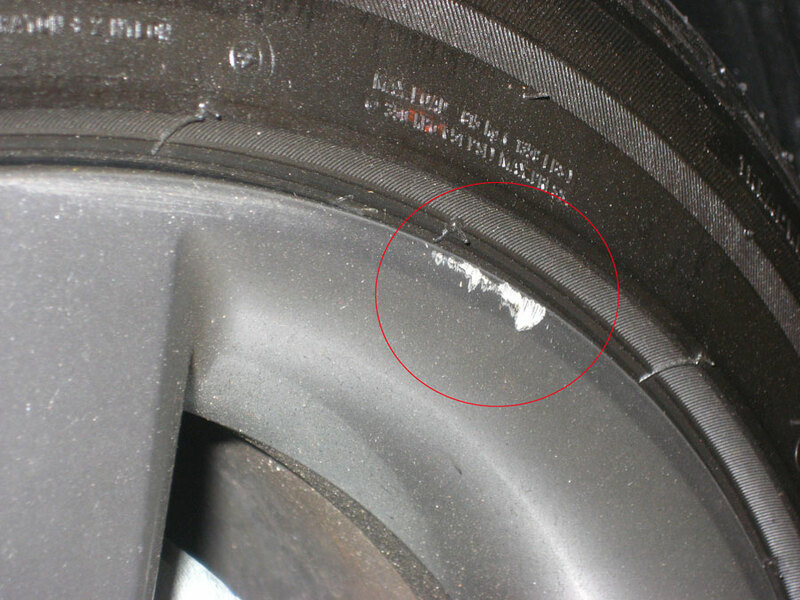 I would say it's only worth getting repaired if it bothers you, although keep in mind how much it will cost (probably nearly $90 a wheel, unless you want to do the labor yourself), and how common and easy it is to curb low profile wheels like those again. As for me, I am still trying to decide if my wheels would look good polished or not. How easily these rims seem to get stained is really making me think twice about a powder coat again. Although I guess like if they were to get stained again... somehow... gunmetal would show it a lot less than standard silver. Last edited by JJ350; 07-02-2007 at 08:03 PM. 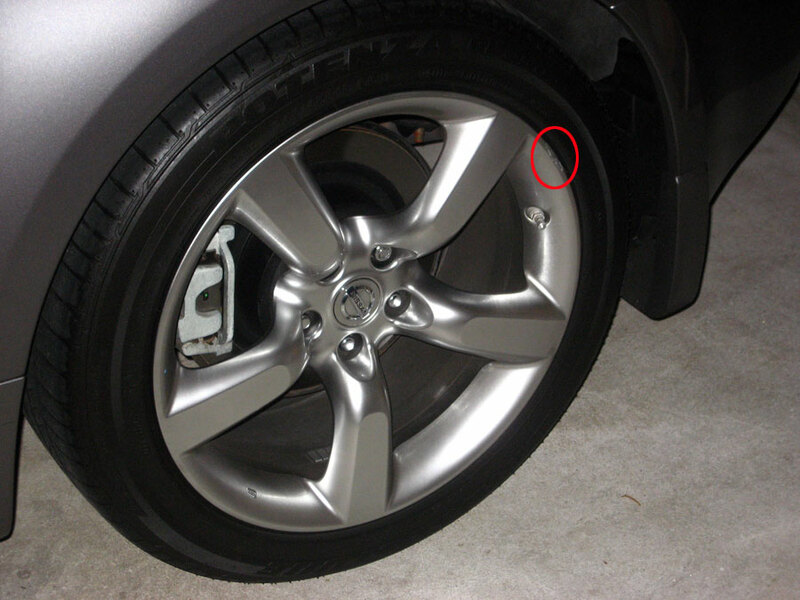 Quick Reply: Getting my stock 06 Grand touring (or track) rims repaired, what finish?